The Praxtour Cruise is very easy to use and designed to provide a comfortable ride. The bike is equipped with extra strong mechanics. ActiveResistance: Automatic resistance adjustments in accordance with changes in inclination. Handlebar and saddle are multi-adjustable, which makes the bike suitable for both bigger and smaller cyclists. Electronic shifting with a gear knob. The easy low access and comfortable stance makes this bike perfectly suitable for elderly and rehabilitating people. 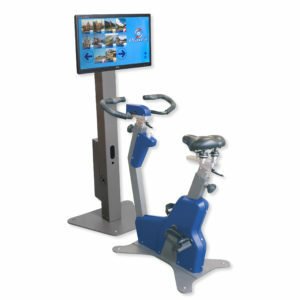 Indoor cycling can be so much more fun!